This entry was posted in News on 28/09/2016 by xapwpadmin. Seven artists interpret the imaginative world of the little-known early 20th century Russian writer Sigizmund Krzhizhanovsky (1887-1950). 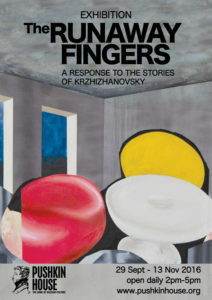 Curated by XAP’s Anya Charikov-Mickleburgh, The Runaway Fingers is a response, executed in a variety of media – including paintings, photography, video and interactive installations – to Krzhizhanovsky’s remarkable short stories, including Quadraturin, Yellow Coal and The Runaway Fingers. The exhibition is hosted at the beautiful Pushkin House, the home of Russian culture, in Bloomsbury. A programme of events is taking place as part of the exhibition, including studio visits and talks by the participating artists, Anya Charikov-Mickleburgh, Nick Clark, Laura Dekker, Ana Oak, Ed Saye, Liz Sergeant and Dina Varpahovsky. 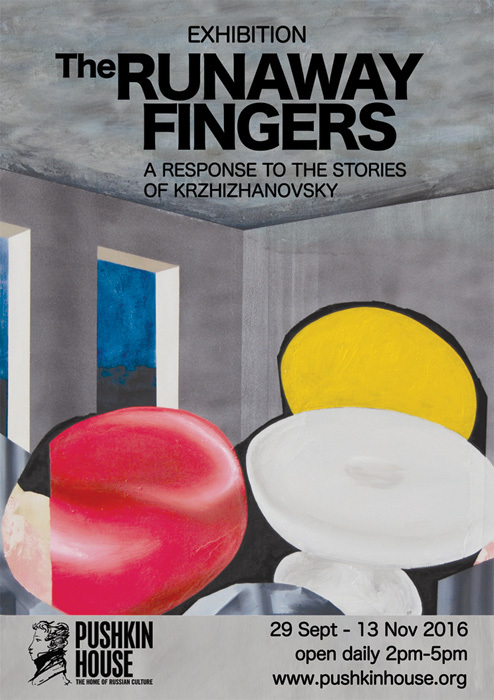 The Runaway Fingers runs from 29th September to 13th November, Monday to Saturday 2-5pm, and by appointment outside those times. Please check the Pushkin House web site as parts of the exhibition are closed for events on certain days.